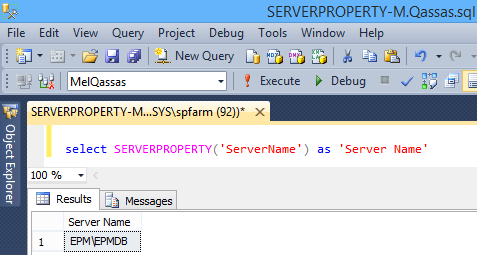 Get the full SQL Server instance name via "ServerProperty". In this blog, we will simply show How to Get the full SQL Server Instance Name using "SERVERPTOPERTY". In this blog, we will simply show how to get the full SQL Server Instance Name using "SERVERPROPERTY"
Use SERVERNAME property to get the full SQL Server instance name. Select SERVERPROPERTY('servername') as 'Server Name'. Use SERVERINSTANCE property to get the SQL Server instance name to which the user is connected.